How Do SSDs Really Work? SSDs (Solid State Drives) work very differently to older HDDs (Hard Disk Drives). This gives them several advantages over HDDs, but also a few drawbacks. SSDs are storage devices that use integrated circuit assemblies as memory. They are able to store data persistently, which means that the data is not lost when the RAM loses power. They differ from traditional HDDs in several ways, making them more efficient in some ways, but also more costly. Here we look at some of the major differences between the two. HDDs are electromechanical storage devices that include a spinning disk and moveable read/write heads which store and retrieve data. SSDs have no moving parts, and instead most employ NAND-based flash memory. NAND-based flash technology is also used in flash drives, or removable USB storage devices. 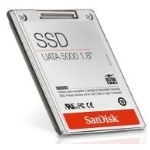 Using flash technology makes SSDs silent as opposed to the noisy HDD, and also less susceptible to shock damage. They also have lower access times and latency, but of course are more expensive – though the price continues to lower as the technology becomes more popular. SSDs also share interface technology developed for HDDs, which means that replacing them is simple. An SSD is comprised of the controller, and the memory to store the data. The memory component used to be a DRAM volatile memory, but since 2009 the NAND flash non-volatile memory is more commonly used because of the reduced cost. NAND is also able to retain data even without a constant power supply, giving it another advantage over DRAM. When the technology was first used, NAND was slower than DRAM but this problem was resolved in 2009 with the use of new controllers. The controller is the part that contains electronics to transfer data between the host computer and the memory components. It also performs other functions, including error correction, bad block mapping and encryption amongst others. The memory is made up of made NAND chips operating in parallel – a single NAND chip is very slow by itself, and has a high latency. Microsoft and Intel first employed data striping to improve SSD speed, and this was improved further still by SandForce in 2011. NAND uses floating gate transistors in a similar way to NOR flash, but it uses groups connected in series rather than a single transistor. Some SSDs are still based on DRAM volatile memory, but must come with either an internal battery or an AC/DC adaptor and backup storage in the event of a power failure. One major drawback of flash memory is that the program-erase cycles are finite; this means that they have a limited life span. Most products on the market can withstand up to 100,000 P/E cycles before the integrity of the storage begins to deteriorate, however. Most NAND devices are shipped with some bad blocks; this enables the manufacturers to produce more units at a lower cost than if all the blocks were required to be perfect, and only reduces the storage capacity by a small, acceptable amount.